The right light for sleep! For those of us who struggle with sleep, lying awake at night is one of our darkest times. My mind races: why can’t I sleep, how will I function tomorrow … making an already miserable experience worse. Physicians and care providers recommend changing your circumstances when you can’t sleep — not lying in bed in the dark, with your mind spinning. But what light is safe to use when you can’t sleep in the middle of the night? We’ve been (correctly) taught to avoid screens, and the light sources in our homes also impact our sleep – here we discuss getting the right light for sleep — what light is safe to use before bed and when you can’t sleep? The good news is that there are certain types of light you can use safely at night without disrupting your biorhythms and making it harder to sleep. light impacts how we sleep = choose the right light for sleep = avoid light which contains bio-active blue! 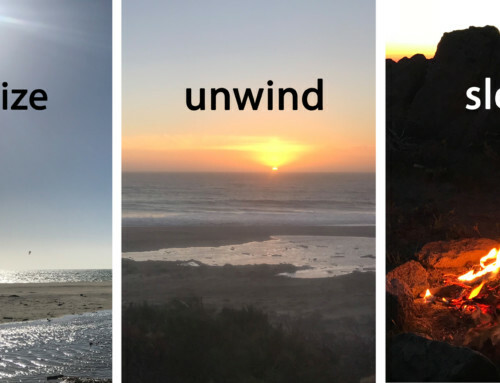 The connection between light and sleep is well documented (see our light and sleep, and circadian rhythm blog posts). In simple terms we need bright blue-rich light during the day (like the sky), AND ‘biological darkness’ (no blue light) for optimal sleep and recovery. The impact of light on sleep is a function of how bright the light is, and how much stimulating ‘bio-active’ blue light it contains. During the day we need exposure to bright blue-rich light to suppress Melatonin production and feel awake and alert. Research clearly shows that exposure to bright light in the morning helps us sleep better at night. Conversely the absence of blue light signals darkness, stimulating Melatonin production and preparing us for sleep and recovery. Exposure to blue light at night suppresses our Melatonin production and signals us to be awake and alert – disrupting our sleep and health. To sleep and feel our best we need BOTH exposure to bright light during the day, AND ‘biological darkness’ at night! Studies suggest that light which does NOT contain bio-active blue can be used safely at night without impacting our Melatonin, sleep and night-time hormone cycles. Unfortunately most of the artificial light sources around us emit stimulating ‘bio-active’ blue light. We need stimulating blue light during the day, but bio-active blue light is bad for sleep and your overall health at night. Dimming the lights helps, but studies show that even low levels of blue light are disruptive at night. Generally speaking screens are the worst, most LED bulbs aren’t good for night-time use, and you should avoid fluorescent office lights at night. Dimmed incandescents and candles are good, and a new class of specially designed ‘human centric’ lights can be used safely at night. 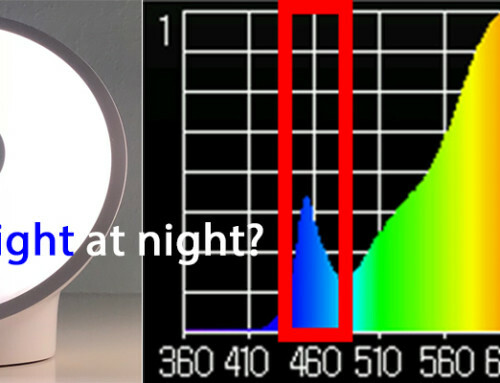 It is best to use light sources which contain little-to-no bio-active blue light at night. light from an iPhone contains a lot of stimulating bio-active blue = be sure to use Nightshift mode! The negative impacts of screens on sleep is well documented. Most screens are powered by blue LEDs which means they emit a lot of stimulating bio-active blue light. The amount of blue light the user receives also depends upon how bright the screen is, and how close to the eye it is. Smartphones and tablets are the worst offenders as we hold these close, and desktops and laptops not much better. Televisions are generally viewed from a distance (unless you’re a gamer) and are therefore less disruptive to our sleep and bio-rhythms (unless of course the content is super stimulating/intense). The blue light emitted by screens can (and should) be reduced with applications like f.lux (for Windows devices), Twilight (for Android devices) and Nightshift (for Apple devices) in the evening and at night, but even in ‘night mode’ screens emit significant amounts of blue light. 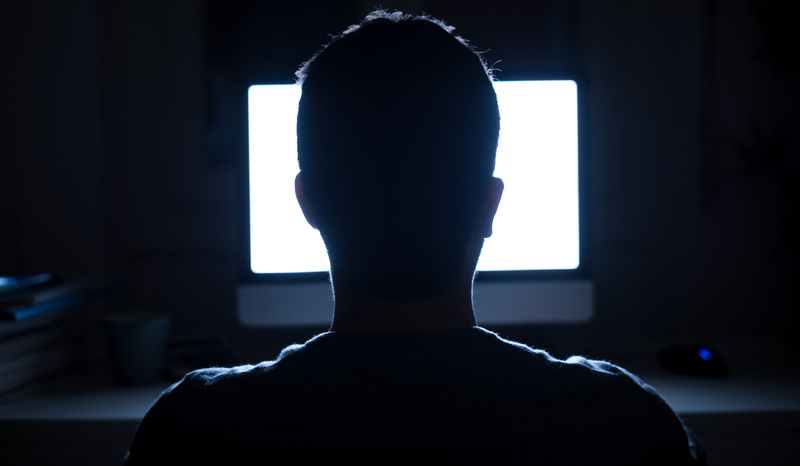 Physicians recommend avoiding the blue light and stimulation of screens at night, and ideally 1-2 hours before bed. the light emitted from LED bulbs disrupts our sleep = be sure to use ‘warm-white’ bulbs in your bedroom! Some LED bulbs are more disruptive than others, but with a few exceptions most emit too much stimulating blue light to be used safely at night. Much like screens, these bulbs are powered by blue LEDs, which are then ‘downshifted’ to create white light. When buying LED lights for your bedroom be sure to look for warmer color temperatures, typically described as ‘warm white’ and rated with color temperatures of 2700K. In simplest terms, color temperature is a rough measure of the ratio of red to blue light emitted by the light source. 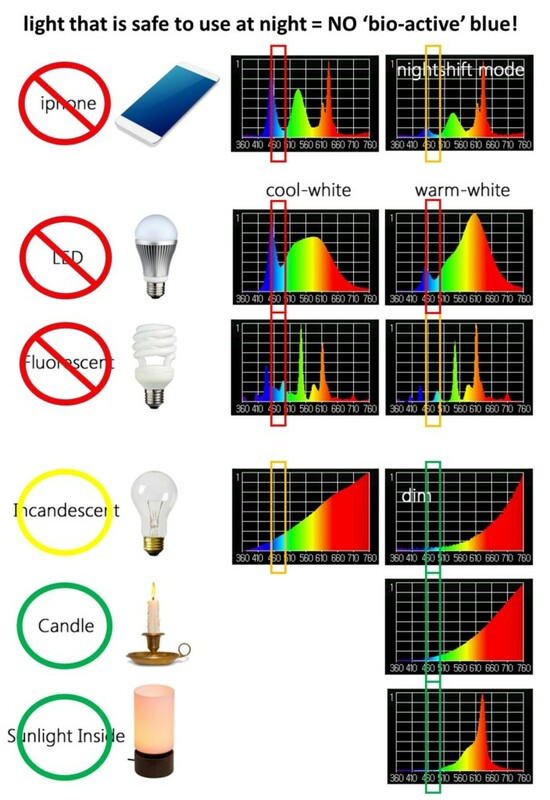 ‘Cool white’ LEDs (>5000K) emit more blue light and are therefore more disruptive than ‘warm white’ LEDS (<3000K). Unfortunately even the ‘warm white’ LED products still emit significant amounts of blue light (see figure above) – too much to be safely used at night, especially for those of us who have trouble sleeping. the light emitted from fluorescents can disrupt our sleep (and is ugly) = avoid office lights at night! Fluorescent lights are the most artificial of the light-sources in our environment, since they create visible light by first generating UV (ultra-violet light) which they then ‘down-shift’ to specific colors of visible light. The resulting light only contains a handful of the colors present in natural light, which is why they make us look like a ghosts (how do you look in the airplane bathroom mirror?). Much like LEDs, fluorescents are available in cool-white and warm-white, with warm-white less disruptive at night. Office lighting is cool white which is OK during the day (albeit not natural or bright enough) but is outright disruptive to our sleep and bio-rhythms at night. Warm white fluorescents are less disruptive, but still contain too much bio-active blue light (see the figure above) to be used safely at night. I’m surprised by just how many hotels still rely on fluorescent bulbs to light their rooms – not the right light for sleep and it makes the room/occupants look bad!? Incandescents are safe to use at night when dimmed = be sure to dim your incandescents at night!! The soft warm glow of old filament style light bulbs (incandescents – also known as Edison bulbs) is the least disruptive as it contains relatively low levels of blue light. Furthermore, as you dim an incandescent, the emitted light gets ‘warmer’ (even less blue light). A dim incandescent is a good light for sleep. Note however that incandescents aren’t able to deliver the bright blue-rich light we need to feel our best during the day (since they are permanently stuck on sunset). We need brighter, bluer light during the day to make us feel awake and alert, and to sleep well at night. Incandescents are also very inefficient sources of light (only ~5% of incoming electrical energy comes out as light) which is why these kinds of bulbs are being phased out. The good news is that GE and other light bulb companies have figured out how to make slightly more efficient ‘halogen’ based versions of these bulbs which are now widely available and offer similar light emission profiles. avoid nightlights which give off bluish looking light = blue nightlights disturb our sleep! Nightlights generally don’t provide enough light for reading or other activities, so we don’t cover them in depth here. That said, I’m horrified by just how many night lights emit BLUE light, since even small amounts of blue light are enough to disrupt our sleep and bio-rhythms at night – buyer beware!! When purchasing nightlights be sure they emit a soft, warm, amber-colored glow. There are special night-lights made for reading at night, for which the same rules apply = they must emit a warm/amber glow or they will interfere with your sleep! new ‘human-centric lighting’ products provide natural light (biologically correct) at every time of day = natural light is the perfect light for sleep! A new class of ‘human centric’ lighting products are now able to provide the ideal light for sleep = light which is biologically optimized for the time of day. 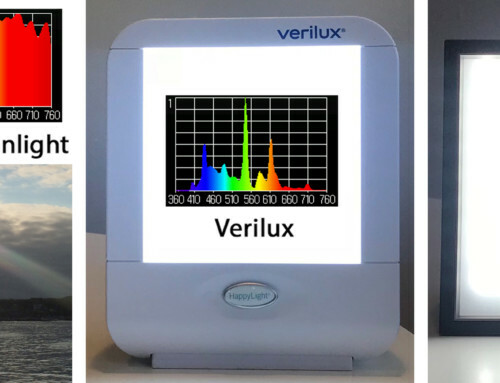 When properly configured, these light sources can provide bright light which is safe to use at night – either by filtering out all of the stimulating bio-active blue light, or by mixing together light which contains no bio-active blue light. Several of these products are designed only to be used at night, for example: bulbs made by Lighting Science Group and GE use filters to minimize the blue light emitted at night. These lights can be used safely at night but they cannot mimic daylight and therefore interfere with our awake-and-alert signal during the day. More advanced human centric lighting products are designed to mimic natural light all day – providing light that’s safe to use at night (no stimulating blue) AND light that’s safe to use during the day (with simulating blue). 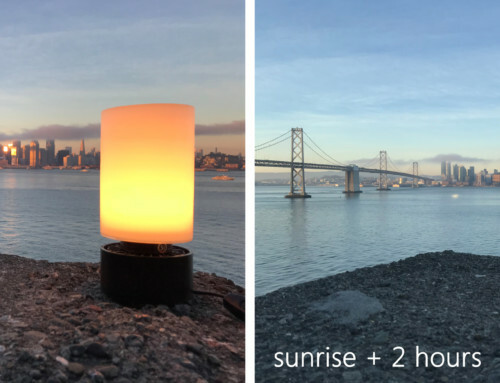 Our mySun and Bottled Sunshine products actively mix light from different color LEDs to provide the perfect light at every time of day — matching natural light! Takeaway message: our bodies rely on queues from light to know when it is time to be awake and alert, and when it is time to sleep. If you have difficulty sleeping, be sure to use lights which are safe at night = either dimmed incandescents, candles, or specially designed human centric light sources. 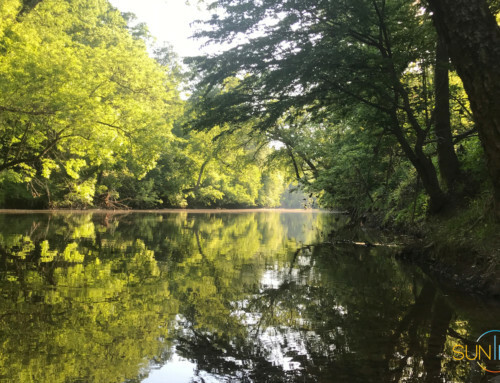 Furthermore: get outside for some bright light in the morning, it’ll help anchor your circadian cycle and support your sleep. Support your sleep by getting the right light for sleep!